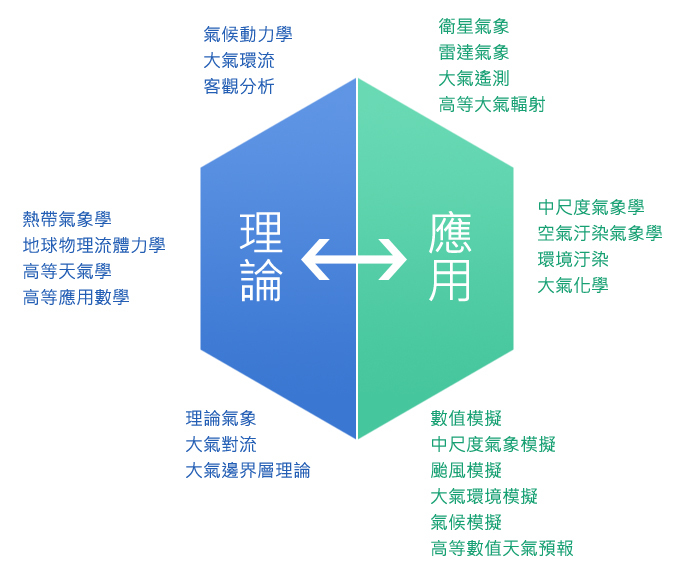 ﻿ 教學與課程 Undergraduate programs | 國立中央大學大氣科學學系 Dept. of Atmospheric Sciences, NCU. The department has two undergraduate programs. One is toward the bachelor degree in atmospheric sciences and the other is toward the bachelor degree in space sciences. The principal goal of the department is to equip undergraduate students with fundamental knowledge in basic sciences as well as general knowledge and tools in atmospheric, space and computer sciences for advanced study or for working in related fields. Therefore, undergraduate students of both programs in their first and second years essentially take the same courses in physics, mathematics, chemistry, dynamics, fluid dynamics, thermodynamics, computer programming and English to acquire necessary knowledge for more specialized courses in later years. For students in atmospheric sciences program, they are required to take atmospheric thermodynamics, atmospheric dynamics, synoptic meteorology and atmospheric physics in their third and fourth years. In addition to these, there are many interesting courses toward more specific fields, such as climatology, environmental pollution, tropical meteorology, radar meteorology, satellite meteorology, numerical analysis, numerical weather prediction, atmospheric chemistry, atmospheric turbulence and etc., for them to choose from. As for students in space sciences program, they are required to take plasma physics, magnetosphere physics, space physics and signal processing in their third and fourth years. Currently there are around 180 undergraduates in the department. Each program has approximately the same number of students. Each year there are approximately 45 new students enrolled into the department, most of them through nationwide college entrance examination. The Institute of Atmospheric Physics is responsible for the graduate programs in atmospheric sciences. The Institute has both the master and the Ph.D. programs. Students in each program are enrolled separately through entrance exam of master or Ph.D. programs. For students studying toward the master degree, the goal of the Institute is to build up their research ability and to equip them with advanced knowledge and research tools in atmospheric sciences. Therefore, they are required to take at least 24 units of advanced courses in atmospheric sciences. Furthermore each student must complete, under the supervision of one of the institute’s faculty member, a master thesis in his/her special field. As for students toward the Ph.D. degree, developing their independent research ability is of primary concern. Therefore, Ph.D. students are only required to take 18 units of courses but are required to, under the supervision of one or several Institute’s faculty members, conduct an original research in their interested fields. Currently there are about 40 students in the master program and 8 students in the Ph.D. program. Along with conventional undergraduate and graduate education, recently the department has established a remote learning classroom for the atmospheric sciences to aid earth sciences education in senior high schools over Internet. Several faculty members within the Earth Sciences College are responsible for the development and maintenance of this classroom.